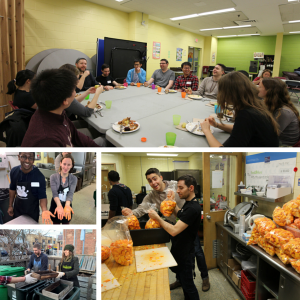 So on December 10th, we closed the inFlow office and headed down to FoodShare to get our hands dirty by helping out in the community. We fostered team spirit amongst ourselves and also made connections with our fellow volunteers. 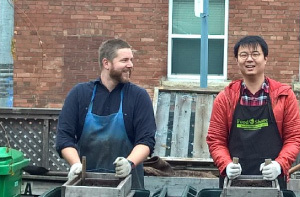 Feeling like the seven dwarfs slinging compost with shovels, and hoping there’d be a lunch bell (so that we could sing “heigh-ho, heigh-ho!”), the compost team got to work digging. 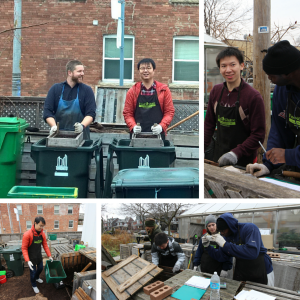 We measured the compost temperature, moisture, and shovelled it into new bins to turn and aerate it. We also sifted the finished compost and mulch, and watered plants. 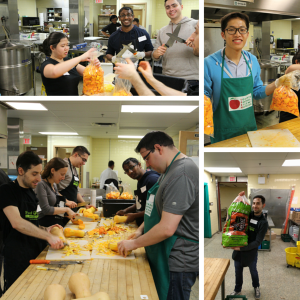 Our team of kitchen ninjas peeled, sliced, and diced enough carrots and butternut squash to a) turn all of their hands a radioactive orange colour, and b) make 1000 cups of “Power Soup,” a program that donates soups to homeless shelters and Out of the Cold programs throughout Toronto. Our kitchen crew reached celebrity status when our developer Brett was tweeted by FoodShare as saying “I’m no longer afraid of cutting butternut squash at home” and Matt, our marketing guru seemed to appear in an ad on the kitchen wall. (We have a theory that he farms in secret). We were also put to work helping with holiday cards, moving furniture, and other odd jobs around the facility. When we told the volunteer supervisor that we were from a software company she teased “this is hardwork, not softwork!” Nevertheless, she was impressed with how much we finished that day. All in all it was a fun day of spending time together while contributing to our community and a time for being grateful. Cassandra Greco is a “customer solutions expert” at inFlow Inventory. You may have even spoken to her in the chat or by phone! When she’s not helping the community find solutions, she runs the inFlow Academy: a training tool for getting started with inFlow!